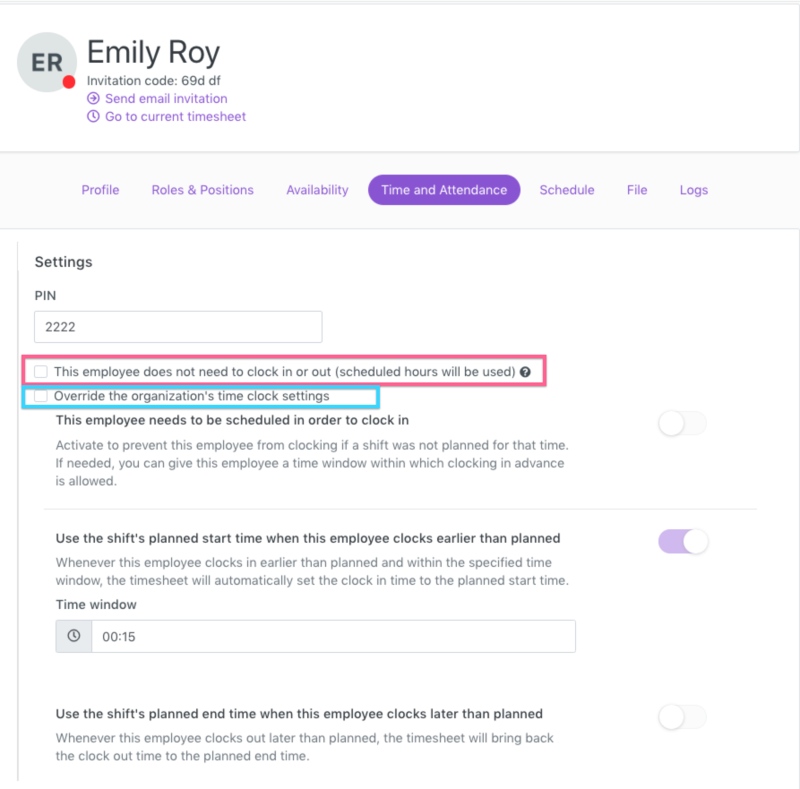 How to customize the clocking rules for a specific employee or department. Some of our Time and Attendance settings can be scoped at the employee level. This can be particularly useful if you have employees requiring stricter or looser clocking rules, for example. You can change the employee PIN, must be between 1 and 10 digits. Scheduled hours will be sent to the time sheets. Regarding all time rounding settings, they are always in the favor of the employer. If an employee is late or if he leaves early, we will never round their entries to the planned time, it will remain at the actual time. If you activate this setting the employee will not be able to clock in if there is not scheduled shift. This setting is strongly recommended. It will automatically adjust the clocked time to the scheduled time when the employee clocks earlier then planned. You can adjust the window this setting is applied on. If the employee clocks before the window, the time entry will not be applied. If the employee clocks in late, Agendrix will not re-adjust the time entry. Same concept as the clock in time but for the OUT time. All clock out times that are after the affected window will not be adjusted and will require approbation. If the employee clocks out before the scheduled end, we will not automatically adjust.